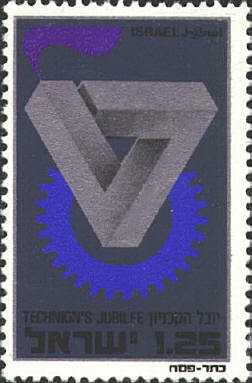 L. S. and R. Penrose illustrated their article "Impossible Objects: A Special Type of Visual Illusion," in The British Journal of Psychology, 49(1958), with a "tribar," a figure similar to that in the stamp from Israel. The design on this Danish stamp issued in 1969 is described by the Scott catalog as an "abstract design." It appears to be similar to the impossible tribar, but it is not quite the same. In this design one can see both the top and bottom of the object, while one can see both the inside and outside of the tribar. I have been unable to determine the source of this object.